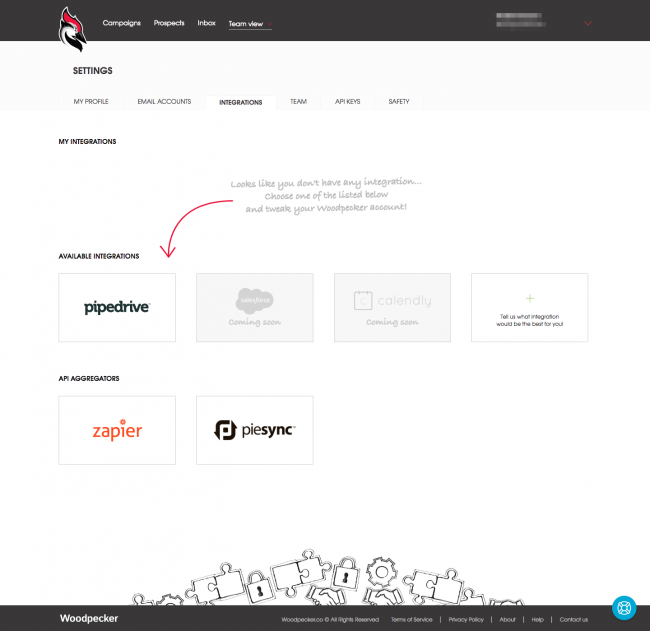 Why did we choose to integrate Woodpecker with Pipedrive? What can a native Pipedrive integration do for you? Who is the Pipedrive integration for? How does the Woodpecker integration with Pipedrive work? Pipedrive is a CRM of choice for a significant part of our premium users. They use it to manage their sales pipeline. Plus, they manually transfer all of the leads they generated through a Woodpecker campaign into Pipedrive. 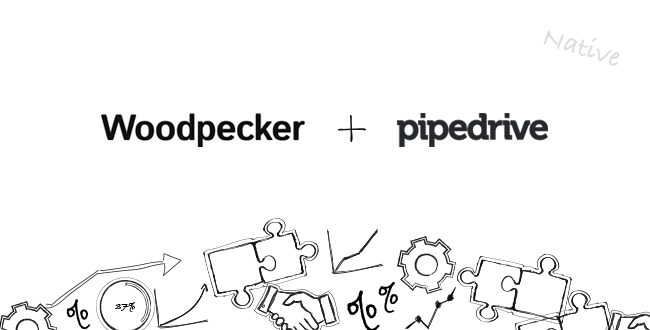 Until now, Pipedrive users were forced to integrate Woodpecker with their CRM via Zapier or a smart BCC option. 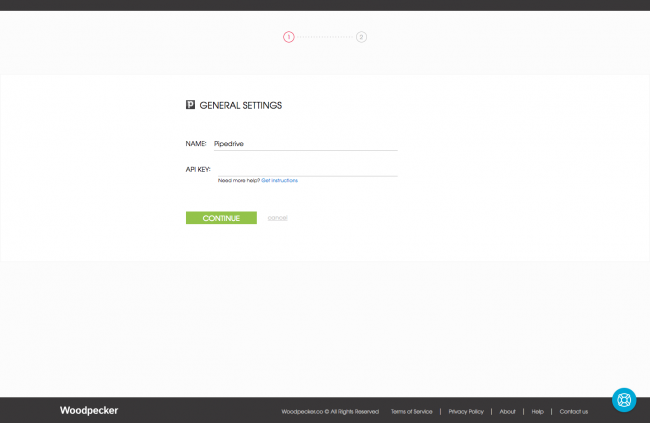 However, convenient as Zapier is, we wanted a native Pipedrive sync for a more extensive integration. The native sync integrates contacts and email click/opens from Woodpecker to Pipedrive for you. To put it simply, prospect data and email clicks/opens from Woodpecker are immediately synced with the CRM. As soon as you add or modify data in Woodpecker, the same data will be updated or created as a contact in Pipedrive. The same goes for activity in the Woodpecker campaign. 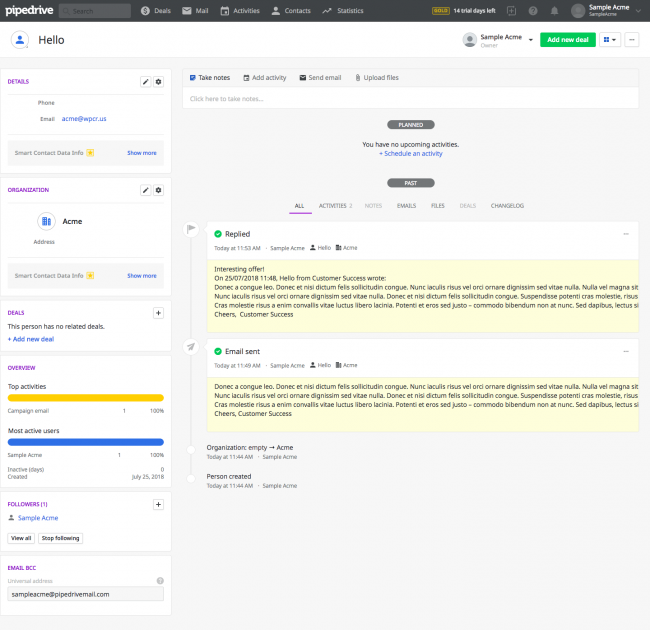 Sent emails, clicks, opens and replies, including auto-replies, are all pushed to Pipedrive. All those things are added as ‘Activities’ in Pipedrive. They are marked as done by default so they don’t disrupt your workflow. So when you add prospects to Woodpecker, their data will be pushed to Pipedrive too. And what follows is that new contacts are added to Pipedrive. 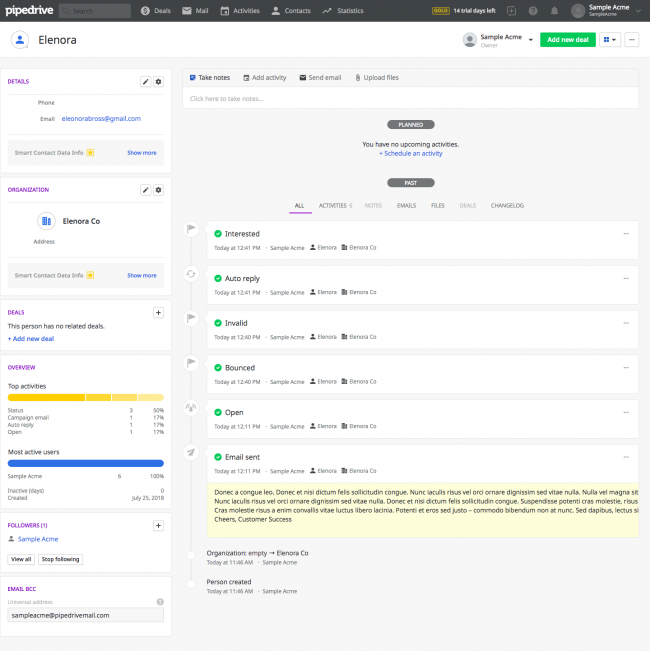 Similarly, if you include a company name in the prospect list that you upload into Woodpecker, the company profile will be created in Pipedrive. You don’t need to do it manually anymore. The native integration does more than syncing prospect data. If something happens within an email campaign in Woodpecker, such as you mark a prospect as interested, that kind of activity will get transferred to Pipedrive. But the plan is for it to do more. The integration is for the Team Pro Woodpecker users who would love to synchronize their Pipedrive account with Woodpecker. 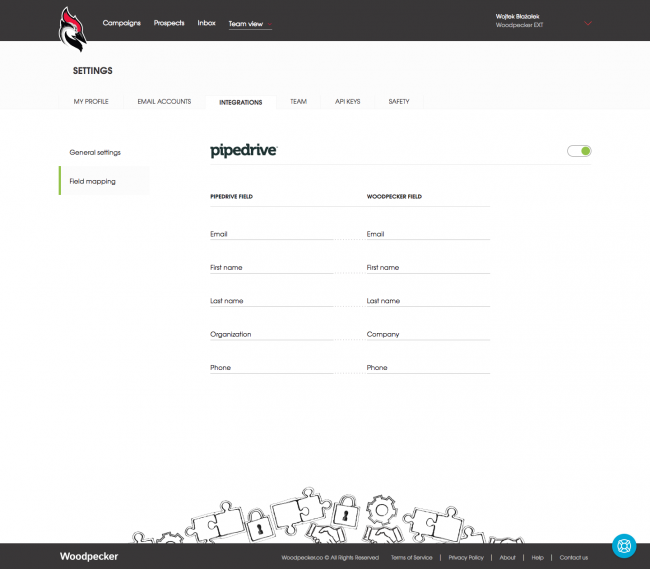 How does the Pipedrive and Woodpecker integration work? 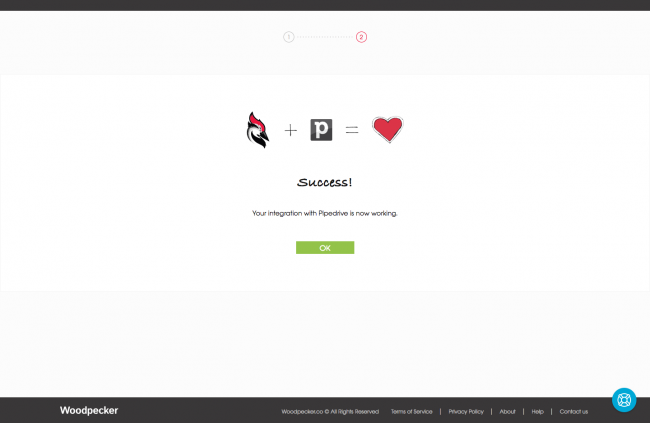 In order to integrate Pipedrive with Woodpecker, follow the steps below. Click on ‘Pipedrive’, you get transferred to a new window. Copy the API key from your Pipedrive account. 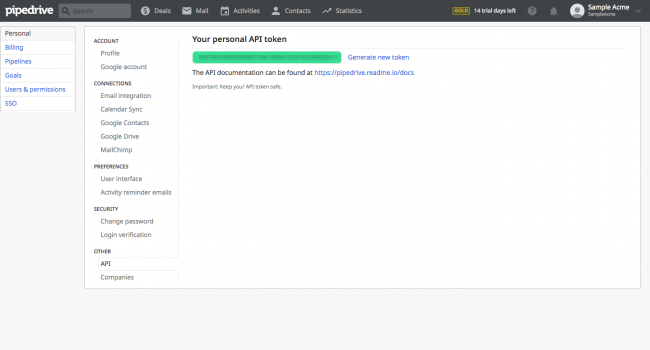 If you don’t know how to get an API key, read this. Woodpecker uses default field mappings. For now, they can’t be edited. It’s ready. But you can switch it off any time you want. Now, let’s see how it looks like in your Pipedrive account. 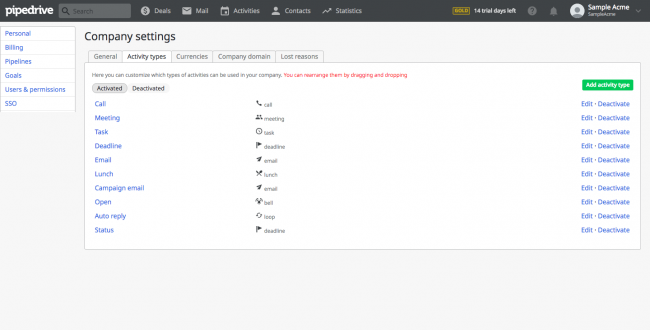 In Company settings, there’s a set of new activities, such as ‘Campaign email’, ‘Open’, ‘Auto reply’ and ‘Status’. Here’s how it looks like when you click on ‘Contact’. As you can see, the details of your Woodpecker campaign performance are automatically transferred to Pipedrive. You can see when an email was sent to a prospect and what was inside of it. You can also see whether they opened the email, replied to it, etc. Bounces, auto-replies, and statuses are transferred too. If so, let us know at [email protected], we’ll help you set up the integration and talk about your experience. Do you want to see other apps Woodpecker integrates with? Go to our integrations tab on the main Woodpecker website.